March Wrap-Up: Health Updates, MOAR Coloring Book Updates, etc. Originally posted on my Patreon. Happy weekend, all, and hello, hello to all the new folks who hopped on board my Patreon this month during my pledge drive! Here’s my monthly update post to sum up what’s been happening around here in March. Another major item I’ve been working on this past month is making a standard edition of my coloring book available to the masses! This has proven more challenging than I anticipated, however. I was going to simply release a version of the book through Amazon’s printing service, but a good opportunity came up that would allow me to print a better quality version myself, so I’m currently negotiating this publishing path. There’s a LOT that goes into applying to be a vendor on Amazon instead of merely applying to be an individual seller, as well as printing considerations you must abide by. Did you know that if your barcode isn’t scannable through your packaging or that if it is placed incorrectly that your book could be rejected and/or a vendor could be fined by Amazon? No? Me neither! I’m still doing research so I can make sure I do this right! I’m hoping that when I’m done that it means my book will be available on Amazon for the easiest buying experience and that I would have even more reach than I would on my own! 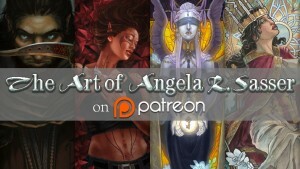 April 26 – 28 – JordanCon 2019 – Come say hi to me in the dealer’s area and check out my original paintings in the Art Show! With a sick hubby still suffering from radiation after effects and other backend tasks (preparing for taxes, getting my Patreon ready for Backerkit integration, etc.) I don’t have a lot of art to show from March, but I’m hoping to change that in April! Thanks to everyone who has been here even during the lean art times. It really makes a difference in our lives, especially during these trying times which we’re hopefully coming out of now!